Shillong Lajong FC ended I league champion Aizawl FC’s unbeaten home record with 1-0 win after the home team squandered their chances here in Aizawl’s Rajiv Gandhi stadium on Monday. The defeat meant that titleholder Aizawl FC dropped five points from three matches and now fifth in the table. After a goalless first half Lajong FC struck in the 60th minute when Lajong midfielder Redeem Tlang taking advantage of confusion in Aizawl FCs penalty box pushed the ball deflected off Aiman al Hagri’s shot into Aizawl FC’s net. Aizawl FC’s last home defeat was against Salgaocar on April 11, 2016 and they have since been remained unbeaten at their home ground. The Mizo club, the only team from the Northeast to lift the I-League trophy started well and created several chances in the first half but could not capitalise their chances. The Shillong outfit started the second half strongly and dominated the midfield and scored a well deserved goal in the 60th minute. Man of the match Redeem Tlang slotted home with a right footer giving Aizawl FC custodian no chance. The champions fought back and dominated the match till the dying minute but could not score a goal. Chances after chances were missed and the strong defensive wall of the Lajong could not be breached. 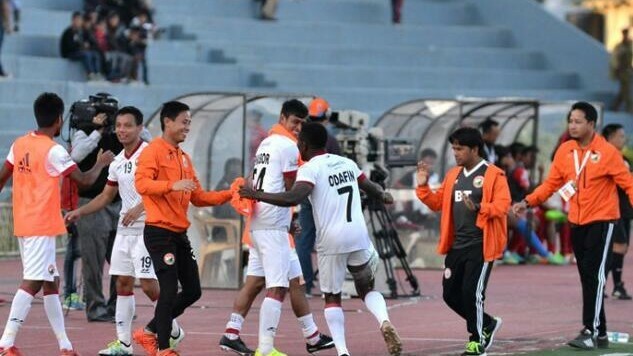 Aizawl FC pressed desperately for an equaliser in the final 20 minutes and Aizawl’s midfielder Muankima created several opportunities but in vain. Even though Aizawl commanded all the statistics of the match with 65 per cent of ball possession with 15 shots the match went in Lajong’s favour. “It was a difficult game, beating us on our home turf and beating the champion team is what all the clubs wanted the most, but we have learnt our lesson,” Aizawl FC’s Portuguese coach Paolo Meneses said. The win took Lajong FC to the top of I-League table with Minerva Punjab.